Recording drum, E.P. model, serial number 002057/31, by C.F. Palmer Ltd., London. Unused surplus apparatus donated by the manufacturer when it shut down. Two physiological stands, iron and steel, by C.F. Three retort stands, assorted dates, by C.F. Palmer Ltd., London. Unused surplus apparatus donated by the manufacturer when it shut down. Pair Cushny myocardiographs, with spare mount and detector, by C.F Palmer Ltd., 1934-1968. Unused surplus apparatus donated by the manufacturer when it shut down. Interval timer, model 2115, by C.F. Palmer Ltd., London, 1972-1974. Unused surplus apparatus donated by the manufacturer when it shut down. Three modified Sherrington stethographs, by C.F. Palmer Ltd., London, 1940-1968. Unused surplus apparatus donated by the manufacturer when it shut down. 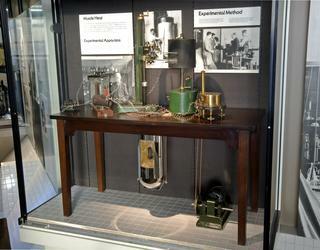 Oxygenator, four cylinder, metal on wood base, for animal experiments, from Medical Research Council, by C. F. Palmer, 63 Effra Road, London, SW2, England, 1901-1930. Recording drum cylinder, by C.F. Palmer Ltd., c1960-1980. Unused surplus apparatus donated by the manufacturer when it shut down. Paper varnisher, consisting of steel rod, paper holder and two drums, by C.F. Palmer Ltd., London, 1953-1974. Unused surplus apparatus donated by the manufacturer when it shut down. 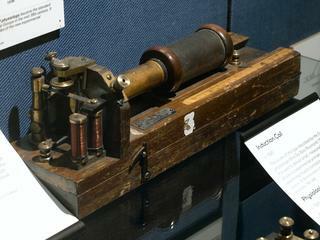 Recording lever, for use with kymographs, by C.F. Palmer Ltd., London, c1934-1968. Unused surplus apparatus donated by the manufacturer when it shut down. 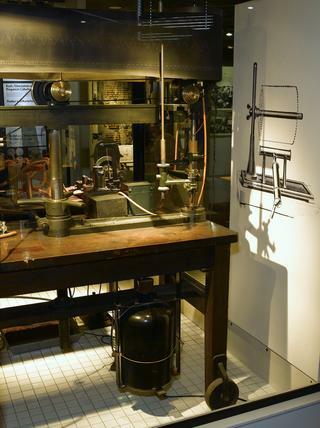 Recording lever, for use with kymographs, by C.F. 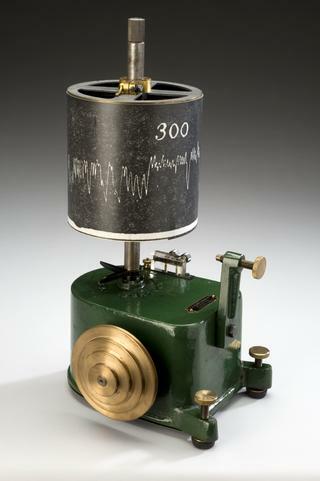 Speed control unit for Sherrington Starling kymograph, by C. F. Palmer ( London) Ltd., 63A Effra Road, London, SW2, England, c. 1955. Collection of 12 assorted boss heads (3 large standard, 4 small standard, 5 open sided) by C.F. Palmer Ltd., London, 1949-1974. Unused surplus apparatus donated by the manufacturer when it shut down. 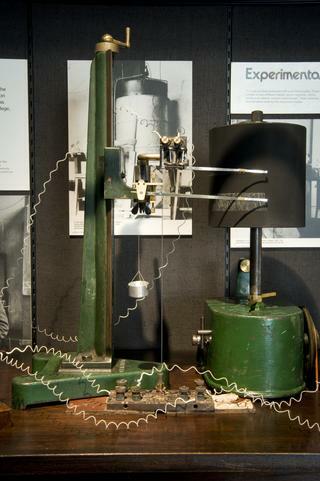 Electric twelve kymograph (stand and cylinder) by C.F. Palmer Ltd. London, c1953-1974. Unused surplus apparatus donated by the manufacturer when it shut down. Signal marker, for student use, by C.F. Palmer Ltd., London, 1972-1980. Unused surplus apparatus donated by the manufacturer when it shut down. Two glass jars for glass jar organ baths, by C.F. Palmer Ltd., London, 1949-1980. Unused surplus apparatus donated by the manufacturer when it shut down. Two glass jars for glass jar organ baths, by C.F. Retort stand, with stone-enamelled base and removable steel rod, c.1959, by C F Palmer, Ltd., London. Unused surplus apparatus donated by the manufacturer when it shut down. Screw adjustable stand, with calibrated height adjustment, by C.F. Palmer Ltd., London, c. 1968-1977. Unused surplus apparatus donated by the manufacturer when it shut down. Stimulator, model 8048, by C.F. Palmer Ltd., London, 1968-1974. Unused surplus apparatus donated by the manufacturer when it shut down. 'Cat' table, made for Sir Thomas Lewis, for his work on the development of the electrocardiograph, by C F Palmer, 403 Brixton Road, London, England, 1901-1910.